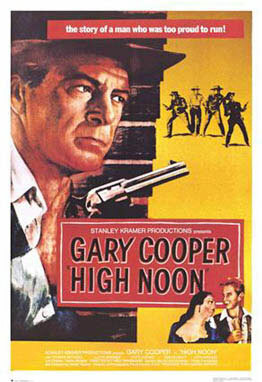 Watching Marshal Will Kane (Gary Cooper) try to gather a posse to eliminate some crazed outlaws in the legendary 1952 Western High Noon one is reminded of George W. Bush assembling his coalition of the willing for the War Against Terror. Swap the black and white baddies for Al Quaida and you could be forgiven for thinking that this is the film that gave dubya his inspiration. The action ticks off at about 10.30am just as Kane is getting married to the luminous Amy (Grace Kelly) – not in a church but before the Justice of the Peace. You see, she is a Quaker and in deference to her religion, which rejects the use of guns and violence the Marshal is handing in his Tin Star. But just as they are about to set off on their honeymoon, a telegram arrives announcing what Tex Ritter has already flagged in the theme song; ‘The noon day train will bring Frank Miller’. Miller, the psychopathic killer was hunted down by the Marshal five years previously but the liberal court system ‘up north’ has let him loose and he’s coming back for revenge. Kane is seen striding down the dusty streets of Hadleyville in the classic hero shot – the camera looks up framing him against the blazing sky. The guy is obviously a giant amongst men but he is treated like the plague – no one wants to join him on his suicide mission and he is confronted by resistance everywhere he goes – in the saloon where his deputy (Llyod Bridges) has defected, in the barber shop where they’re busy building extra coffins in preparation for the shoot out and in the hotel where his newly wed and his ex lover, the fiery Mexican Helen Ramirez (Katy Jurado) are getting to know each other a little better. Shots of clocks punctuate the action as it counts down to noon, reminiscent of the TV series 24 in which a similar feeling of real time is used to put pressure on the central character. Finally the pendulum swings like a noose as Kane, all alone in the world, writes his Last Will and Testament. Then, as the showdown begins, Amy the Quaker takes up arms. It’s hard to imagine Lara Bush defending her man on the battlefield but this is a movie, after all, and unlike in life, we’re assured of a happy ending.